"At Last! Dynamic Baseball Hitting Drills That Prepare Your Team For REAL GAMES!" Coaches: STOP wasting your precious practice time on useless activities, and finally discover the hitting secrets that give you a massive competitive advantage. Did you know that some of the most popular baseball hitting drills out there - the same ones many so-called hitting "experts" are telling you to use - are based on outdated, ineffective hitting concepts that are just plain WRONG! "Squish The Bug" is an old standby that nearly every Little League coach has heard, and many hitting instructors use it to encourage better hip rotation. BUT, turning the back foot actually does more HARM than good, limiting proper weight transfer, collapsing the backside, and causing your hitters to hopelessly "spin off" the ball! "Roll The Top Hand" is often used to help players pull the bat through the hitting zone, but it actually robs power from your swing! To take advantage of the power that explodes from your wrists, the top hand should be facing up and the bottom hand should be facing down at the point of contact. Never roll the top hand over until well after contact is made! "Get Your Back Elbow Up" has probably killed more baseball dreams than all the other pieces of bad hitting advice - combined. Instead of getting on top of the ball and hitting more line drives, it actually develops a longer, slower swing, making it harder to get the bat around on fastballs, or adjust to the speed of a curveball or changeup! As long as you keep teaching these techniques and using these drills in batting practice, your team will continue to struggle. The strikeouts and losses will continue to mount up. Your coaching credibility will continue to plummet. And your players will get more and more bummed out and depressed with their baseball experience. But don't worry. I've got good news for you: a simple solution to your batting woes that's easy to learn and easy to implement, whether you're a grizzled baseball veteran… or this is the first season you ever walked onto a field. 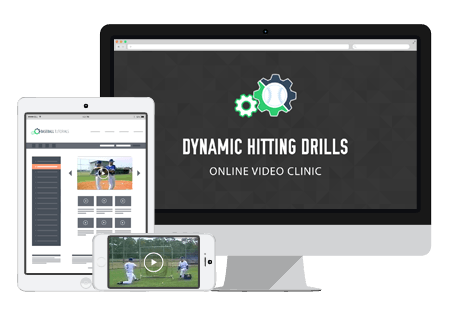 It's a brand new baseball coaching resource called "Dynamic Hitting Drills." Inside, you'll learn 23 simple, fun, and wickedly effective batting practice activities specifically designed to teach your players the CORRECT mechanics of hitting, then transfer those skills into real, live in-game competition. The secret is combining the proper TECHNICAL skills (like coordination, rhythm, power, and bat speed), with TACTICAL skills (like knowing how to adjust your swing to different pitch types and locations). 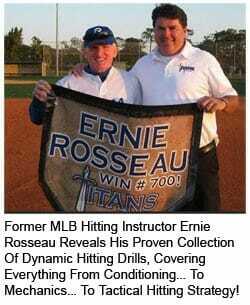 Your instructor is Ernie Rosseau, one of the finest (and most respected) hitting coaches in America. If you're not familiar with Coach Rosseau, he cut his teeth on the Florida Junior College Baseball circuit… winning more than 700 games and making several appearances in the National JUCO World Series. But he REALLY made a name for himself as a top-flite hitting consultant to MLB and Minor League teams, spending years with the Chicago Cubs, Chicago White Sox, and New York Mets. Inside this online clinic, Rosseau takes you through his own hand-picked progression of dynamic drills covering everything your hitters need to learn… from conditioning… to mechanics… to tactical hitting strategy. Med-Ball Drill: Trains hitters to rotate forcefully through the trunk in both directions, while maintaining their balance. This is the #1 key to recruiting more power from the lower body, and smashing the ball with jaw-dropping power! Weight Transfer Toss Drill: Teaches the correct "load-unload" sequence for triggering the swing, then exploding through the hitting zone. Do this correctly and instantly increase your bat speed! Roll-Up Drill & Squeeze Drill: A 2-part progression that builds exceptional finger, wrist, and forearm strength, for lightning quick bat speed and superior barrel control. Lead Bat Drill: The fastest, easiest way to create more resistance in the swing, for monstrous upper-body strength that translates DIRECTLY into more home runs and extra-base hits! Balancing Board Drill: Develops rock-solid lower-body strength and endurance, so you can swing at 100% effort, without falling off balance! Balance Beam Drill: Heightens your athlete's spatial awareness by challenging the vestibular system… for a more balanced, more controlled swing that's loaded with so much power, it'll make your head spin! Tube Drills: A 4-step progression that helps coaches isolate and correct mistakes, while reinforcing the proper mechanics of the swing. Swing Drill: Helps players develop tighter, more compact hitting mechanics. They'll stop "looping" the swing, and get "faster to the ball" almost immediately! Top Hand Drill: Establishes the correct path for a solid, consistent line drive swing. This one tip can transform almost any hitter into a Triple Crown threat -- almost overnight! Pivot Drill: Promotes a quicker bat and more effective wrist snap, so you can put the sweet part of the bat on the ball every time -- almost automatically! Whirly Bird Drill: A great hitting tool that allows your players to get a massive number of swing reps in only a few minutes of practice. Long Tee Drill: Helps your hitters keep the bat head in the zone from trigger through contact. This one secret alone transforms dribbling ground balls into scorching line drives! Bat Attack Drill: A fun "one-on-one" drill that tests your hitters' bat speed against each other. PERFECT for injecting some competitive intensity into your practices! Mirror Drill: Helps your players become their own best hitting coach, so they can increase their mechanical awareness, spot errors and correct them on the fly! IMO-123 Tee Drill: A live batting practice drill that reinforces the correct swing path for all the most common pitch placements. Talking BP Drill: Trains your hitters to read and react to different types of pitches in a real game situation… from the "up and in fastball"… to the "low and away changeup"… to the "curveball in the dirt"… and everything in between. Gives your kids unshakable confidence to perform in even the most pressure-packed situation. Low Tee Drill: Trains your hitters to take a breaking ball off the outside of the plate (one of the trickiest pitches in baseball) -- and DRIVE it to the opposite field with maximum power. Opposite Field Drill: A fun short toss drill that trains your hitters to sit back on an outside pitch, close the lead shoulder, keep the bat head up, then drive the ball to the opposite field. Identification Drill: Learn how to instantly recognize every pitch directly out of the pitcher's hands… Never be fooled again! There's no useless fluff here either. No egghead discussions on the science of hitting. Just pure, powerful hitting drills that are brain-dead EASY to implement for ANY age or competitive level… no matter how little (or how much) coaching experience you have right now.